OLD PARKED CARS. 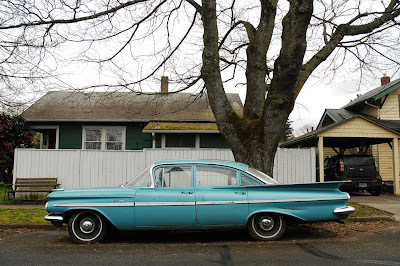 : Sunday Bonus: 1959 Chevy Bel Air, revisited. Sunday Bonus: 1959 Chevy Bel Air, revisited. Previously documented with my old iPhone in Jan 2010, and yesterday I was finally able to do this car proper justice. Beautiful. Love the rear badge/trunk shot, what a texture on the trunk. Great color color too, black half-moons and a very 50's shade of blue. apparently i've matured as a person since you first documented this, because i distinctly recall giving it the cold shoulder before. also, i realize that i didn't appreciate the rarity then, as i now realize i haven't seen a single one in person in, including this one. holy wow, look at the patina--moss, oxidizing trunk, hood and roof, scarred rear quarter. 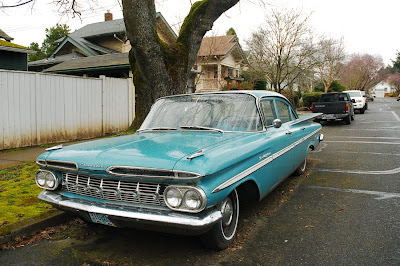 this is exactly the kind of car i expect to get snatched up and rotisserie restored as a gleaming garage ornament. ...although i suppose four-doors are nowhere near as valued as the two-doors. 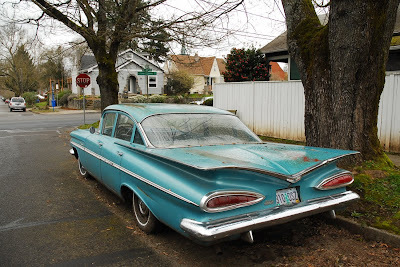 the ubiquitous pillarless hardtop makes the side profile here look pretty busy--check that rear glass triangle chopped in behind the rear door and the leftover shape between the doors at the rocker. how about that "dog-leg" a-pillar? love the thin-stripe whitewalls, even if they're not correct. What I really love about these old cars are the yearly styling changes that make them so unique. The tri-fives are so overblown, the '58 is a blimp on steroids, and the '60 is just plain ugly (compared to the '60 Ford and even the '60 Edsel). The color, the chrome, and especially the 'face' in the back- these cars are so strange and attractive. You just can't ignore it- you have to look. 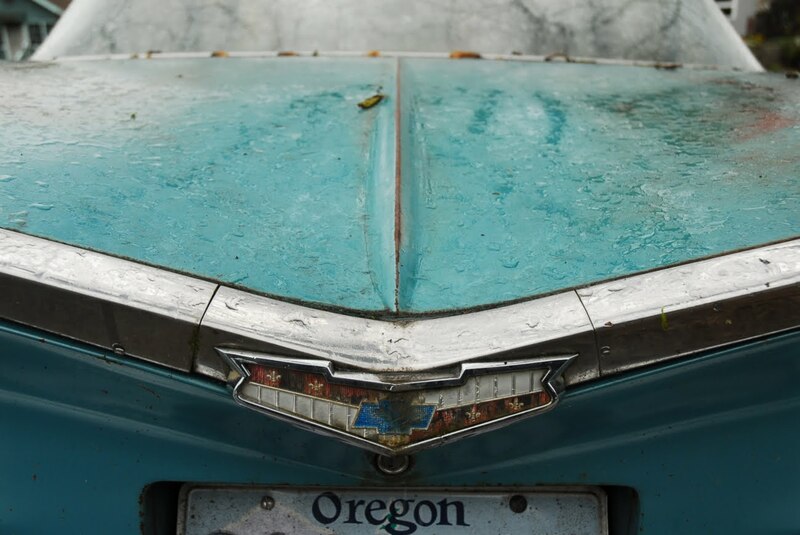 I admire the Oregonian patina. Anywhere else they would hot-rod, rat-rod, rotiserrie etc. I only wish you got a picture of Aunt Edith getting in to drive it to the grocery store. We had one of these when I was a kid. The rear passenger floor rotted through and we loved to lift up the mat and watch the road go by (!!!!!) My dad put in some sheet metal eventually. 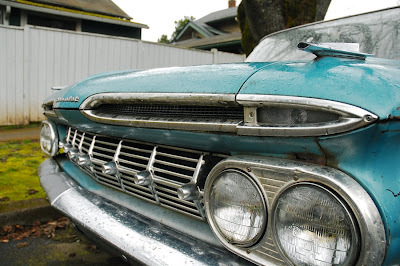 "...The rear passenger floor rotted through...put in some sheet metal ..."
But it was a '60 Brookwood wagon.